This morning’s Chronicle of Higher Education features a nice article by Katherine Mangan about the Prison Entrepreneurship Program and our partnership with the Baylor University Hankamer School of Business (see our press release on this partnership here). At a prison near Houston, local business people critique presentations of business plans created by prisoners in a program run by Baylor U.
Mike Potts was halfway through a five-year prison sentence outside Houston when he heard about a program that would help him start a business when even buddies with clean records were struggling to find work. The Prison Entrepreneurship Program, run by a nonprofit group of the same name, works with Baylor University’s Hankamer School of Business to train convicted felons to write business plans, market their ideas to investors, and develop workplace skills. Successful participants earn certificates from Baylor and, organizers hope, fare better than average in returning to society. For six months in the Cleveland Correctional Center, Mr. Potts, 38, pored over Harvard Business School case studies with professors and M.B.A. students and engaged in classroom discussions with fellow inmates. He developed a plan for a home-renovation business that he presented over and over again, fine-tuning it with critiques from students and local business leaders. Now Mr. Potts is one of about 850 graduates of the nine-year-old program, which has spawned a similar effort that started last spring at the University of Virginia’s Darden School of Business. The goal of both programs is to help ex-convicts avoid prison’s all-too-often revolving door. In Texas, all of the graduates in the past three years have landed jobs within 90 days of their release, according to program administrators. Of 2009 graduates, fewer than 7 percent were back in prison within three years, compared with state and national averages of 25 and 50 percent, respectively. Graduate students are central to both programs: Up to 50 students at Baylor participate each semester, visiting prisons and conducting market research for the participants, whose own Internet access is restricted. Students from more than a dozen other business schools, including those at Brown and Harvard Universities, the University of Houston, and Texas A&M University, also act as advisers to inmates, with a program employee serving as an electronic go-between. Participants in the program have included former gang leaders, drug dealers, and even murderers. But the screening is strict: Only about 5 percent of applicants are accepted. They must have a high-school diploma or GED, be within three years of release, and demonstrate a commitment to changing their lives, program staff say. Those who get in are transferred to Cleveland, a minimum-security facility just north of Houston. For three months, the inmates spend 22 hours a week on character development and computer skills. Then, for six months, they work 40 hours a week on college-level entrepreneurship training. Each inmate pitches a business plan dozens of times, culminating in a competition. 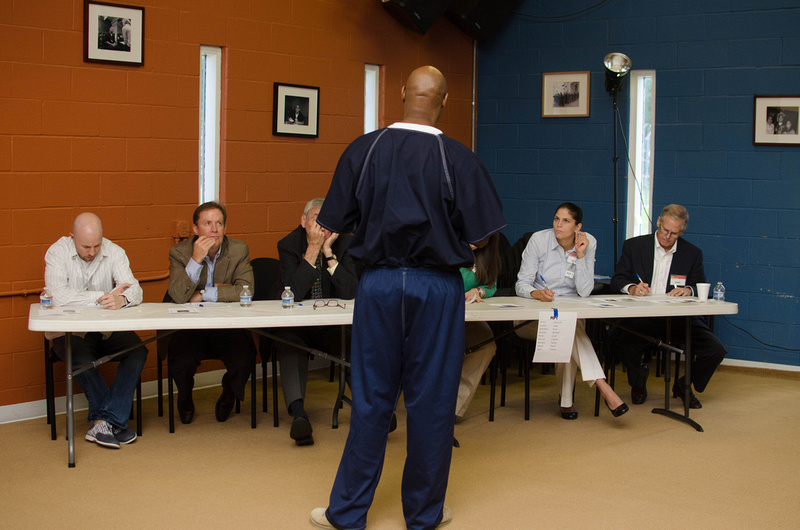 In their navy-blue prison uniforms, they deliver 30-minute presentations to panels of students and business leaders. “Lots of them take the creativity that got them into trouble and channel it to a more useful purpose,” says Greg G. Moore, a graduate of the program who now works there as a case manager, helping inmates transition out of prison. As part of the program, graduates also get relocation assistance and continued mentoring. Within weeks of his release, in July 2011, Mr. Potts got his renovation company up and running. Today he has several employees and a two-month backlog of residential and commercial projects. His company is one of about 120 small businesses incubated in Cleveland’s cinderblock classrooms. The program was already training inmates in 2007, when a Baylor alumnus who served on its board invited Gary R. Carini, associate dean for graduate programs, to visit. Last year Baylor extended its partnership by awarding certificates to the program’s graduates. In Virginia, the impetus for the program came from an inmate who wrote to Darden’s dean, Robert F. Bruner, asking whether the school could help him find a job after his release. The dean turned to Gregory B. Fairchild, an associate professor of business administration who has studied small-business financing in low-income communities. Mr. Fairchild led a group of students to Texas to study the program there before adapting it. In Virginia, M.B.A. students go into both men’s and women’s prisons, and participants earn certificates in entrepreneurship from the university. Applicants must be enrolled in a vocational course, have a high-school diploma or GED, and be within 18 months of release. A Darden certificate, Mr. Fair­child hopes, gives potential employers a reason to consider an ex-con. Unlike other credentials earned in prison, the certificates leave that part out. “The person isn’t carrying the scarlet letter that says ‘Virginia Department of Corrections,'” he says. In teaching cases that involve cash-flow analysis or inventory management, participants’ shaky math skills are one of the biggest roadblocks. Math review is a crucial part of the program. The first visit to prison can be intimidating for professors and students. “I was amazed and engaged and afraid, all at the same time,” Mr. Fairchild says. Laura Durity, one of 10 second-year M.B.A. students working with the program this year, has presented Darden case studies at both the men’s and the women’s prisons, using her professors’ Socratic method to stimulate discussion. Undergraduates at Virginia also assist inmates with market research. An aspiring baker, for instance, asked for help calculating the wholesale price for wedding cakes and pastries and identifying his competitors. A would-be plumber wanted to know about tax liability and insurance. Texas inmates get similar feedback and encouragement as they strive to reinvent themselves. James Dovea, 43, has worked his way up to project manager at a solar-power company since he was released from prison, in 2010. The entrepreneurship program was the kick in the pants he needed, he says, while serving time for intoxication manslaughter.